If you have been interested in the benefits of composting at home, but have been a little intimidated by what may seem like a complicated process. I have recently started hearing about Bokashi composting, and decided to do a little research into the possibility. Bokashi is a Japanese term that means "fermented organic matter." It is an anaerobic fermentation process, as in the absence of oxygen. This method has been used by farmers in Japan for centuries, but has only been recently introduced to the United States. Not only is the process simple and quite fast, there is little to no smells and you can compost all food scraps, including meats and dairy. All you really need is a couple of buckets, a lid, Bokashi mix, and organic waste. It can be done on a small or large scale, and results in a much different end product than traditional composting. 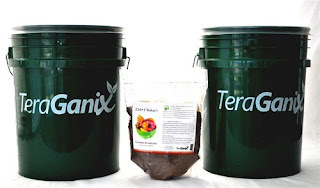 Bokashi composting produces a slow-release fertilizer for your gardens and is a simple way of dealing with kitchen waste. To create your own system, purchase two identical buckets, so they can stack inside each other while leaving space at the bottom. These can be found at your local home improvement store. Make sure they come with lids that seal tightly. You'll only need one of the lids. You'll also need a "mid-lid." This is some kind of weighted plate that fits inside of the bucket. You can search thrift stores for ceramic dinner plates, or even the lid to an old soup pot. This plate should ideally be outfitted with a handle or knob so it is simple to pick up out of the bucket, without getting your hands dirty. Drill several small holes in the bottom of the top bucket to allow liquids to drain away from the food scraps. This liquid is known as Bokashi juice or Bokashi tea, and can be poured down kitchen drains to prevent unpleasant smells or clogs. This juice can also be diluted in a ratio of one cup to five to six gallons of water for a wonderful fertilizer for plants. Keep in mind that your must use it within 24 hours of draining it from the bucket. There are also pre-made compost systems that you can buy if you want to save a bit of time. You are now ready to add a layer of Bokashi mix in the bottom of the bucket. Top this with two inches of food scraps, and remember, with this method, you can compost just about anything. Uncooked and cooked meat, eggs and shells, cheese, and yesterday's pasta dish can all be added. It's best to puncture sealed items like grapes or tomatoes so that microbes can get inside and get to work. Cover this layer with more Bokashi mix, and use your mid-lid to press down and remove air. Close the lid tightly. As you accumulate more organic waste, keep adding to the bucket with the same process until it is full. Wait at least two weeks, without opening the bucket, for the fermentation process to complete. The contents should then be placed in a hole in the garden, covered with dirt, and left for an additional two to four weeks.